Some parents walk or ride bikes with their children as part of an international celebration. PORTLAND – When Sandra Gorsuch-Plummer arrived at Lyseth Elementary School five years ago after working in the Scarborough school system, she was surprised to see so many children walking and riding their bicycles to school. 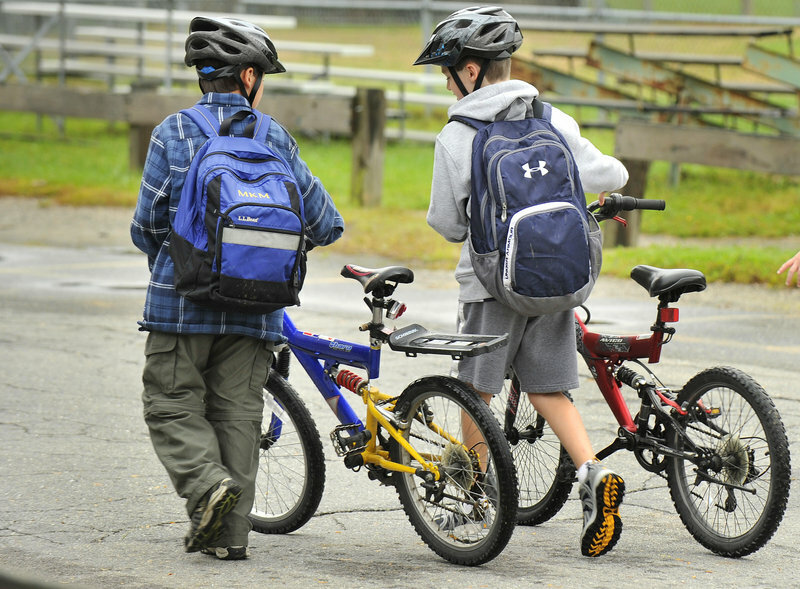 Two students head to the bicycle lock-up area after pedaling to the Portland school. On Friday, to celebrate International Walk to School Day, the students at Lyseth ramped up their ambulatory efforts. More than half of the school’s 525 students walked or rode bikes to school — 50 to 100 more than usual. Children begged their parents to walk or ride bicycles to school with them, said Sheila Sullivan, a parent who organized the effort. “There were big smiles all the way around,” she said. Schools around Maine participated in the program, which originated in 1997. Organized by the Partnership for a Walkable America, it was initially called Walk Our Children to School Day. The event became international in 2000, when the United Kingdom and Canada joined for the first International Walk to School Day. In 1969, about 90 percent of children who lived within a mile of school walked or rode bikes to class, according to a study by the U.S. Centers for Disease Control and Prevention. By 2004, just 48 percent walked or rode bikes at least one day a week. Advocates who are concerned about childhood obesity say that children increasingly are adopting the car-commuting lifestyle of their parents. 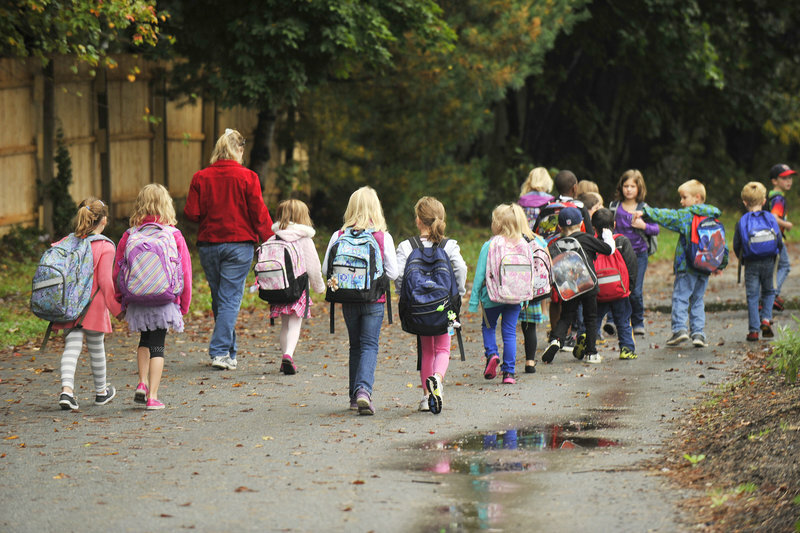 They say communities must do more to encourage children to walk to school, such as making sure that there are safe walking routes and that new schools are built within walking distance of dense neighborhoods. Childhood obesity is one of the costs of sprawl, said Nancy Smith of GrowSmart Maine, an advocacy group that seeks to overturn state and local policies that promote sprawling development. “Having a walk-to-school day is a way to remind people that this used to be normal, and we would be healthier if we did more of it,” she said. While Portland has dense urban neighborhoods, it also had busy arterial roads that are intimidating, like Washington Avenue and Allen Avenue Extension, both of which pose barriers for children who want to walk or ride bikes to Lyseth Elementary. The city needs to find ways to help children feel safe crossing those roads, Sullivan said. It’s not just about being healthy. Walking to school alone or with a sibling helps children mature, Gorsuch-Plummer said.